You have a product or service to sell and you’ve identified your target audience, but now you need to create an effective message that leads to sales. Marketing personas are composite sketches of a key customer segment of your audience, according to the Content Marketing Institute. These sketches help deliver content that will be most relevant and useful to your audience. 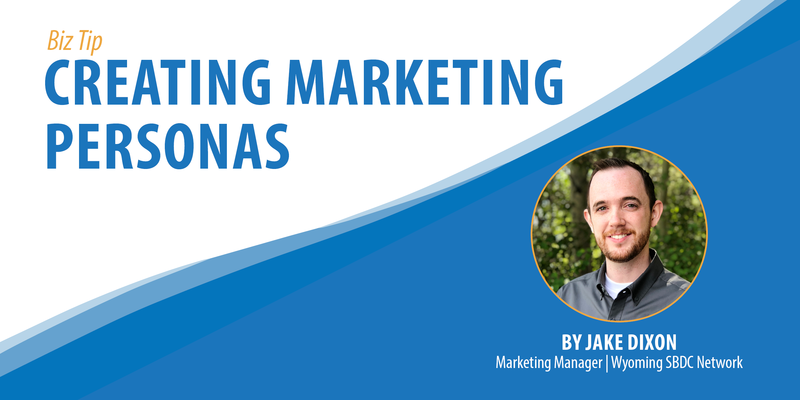 So how many marketing personas should you create? Three to five is a good place to start. As your marketing efforts expand, you may find it beneficial to have one for each product or service you offer. Just make sure each persona is distinct and the information is backed up with data — either from demographic research or insight of your current clientele. If you’re ready to get started on building marketing personas for your business, the Wyoming SBDC Network is here to help. Our no-cost advising and market research will help you to create accurate, useful personas to tailor your messaging to the appropriate audience. Contact your local advisor and get started today by clicking here. About the Author: Jake Dixon is the statewide Marketing Manager for the Wyoming Small Business Development Center Network. Jake received his bachelor’s degree in Advertising and Public Relations from Idaho State University (ISU). He spent 12 years working in television news before crossing to the other side of media as Director of Public Relations for ISU’s health care programs—which make up one third of the university. Jake’s background has also given him valuable experience with all aspects of social media management, graphic design and video production. When he’s not in the office: Jake enjoys taking road trips with his wife, catching the latest movies, and spending time working in the garage, garden or on household projects.